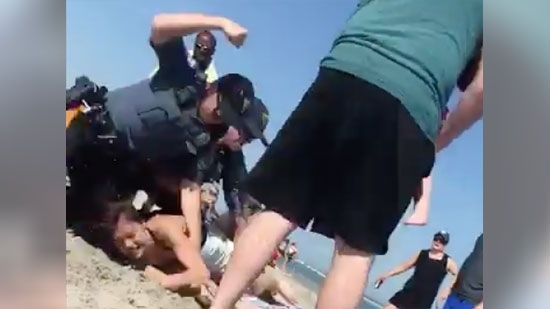 The officers who were involved in the violent arrest of Philadelphia woman caught on tape on a Wildwood beach over Memorial Day weekend will not face criminal charges. Cape May County Prosecutor Jeffrey Sutherland said that his office reviewed both the Wildwood police body-cam footage and footage shot by a beachgoer. They also reviewed statements from witnesses. He said in a statement, "As County Prosecutor, I recognize that the video footage has raised a lot of questions regarding the officers' actions. A decision such as this is not based on emotion; it is based upon applying the proper laws, policies and directives that govern law enforcement." The Wildwood Police Department's Internal Affairs Unit is conducting their own investigation. Five people were injured when two SEPTA Regional Rail trains made contact in North Philadelphia this afternoon, 6/5. It happened around 4:15 p.m. near 9th and Berks Streets. Train 9243 heading south from Temple University to Newark was carrying 5 passengers. Train 6313 heading south from West Trenton to Center City was carrying 3 passengers. The injured were transported to Temple University Hospital with minor injuries. There is no word on what caused the minor collison. A Delaware County woman is charged with selling fentanyl to her neighbor who then died of an opioid overdose. 39-year-old Alexandria Santa Barbara of Chester faces charges of drug delivery resulting in death, involuntary manslaughter, and related charges. On March 29th, authorities were called to Avon Rd. for the report of an unresponsive man. The 51-year-old was pronounced dead at the scene and the medical examiner later determined he died from an overdose. The victim was seen earlier that day talking with his neighbor across the street, Santa Barbara. She also told a friend that she "gave the guy across the street a bad bag" and felt guilty. She faces 20-40 years if convicted on the drug delivery charge.